Coach Darryl Paziuk's Bantam Girls are golden, after sweeping the Alberta Basketball Youth Provincials on March 9-10! The girls opened the tournament on Friday night, winning 33-31 vs. Okotoks. Later that night, they beat Southeast Swarm Hutchings for the third time this season, by a score of 33-27. On Saturday morning, our girls beat St. Albert Slam Nunez 45-27 in their fourth meeting of the season. In the gold medal game, Morinville prevailed against Southeast Swarm Hutchings, 39-34. Following the win in the gold medal game, Hailey Van Brabant, a second-year Bantam player with the Sabretooths, was named Tournament MVP and received a $100 Tangerine Bright Way Forward Scholarship. 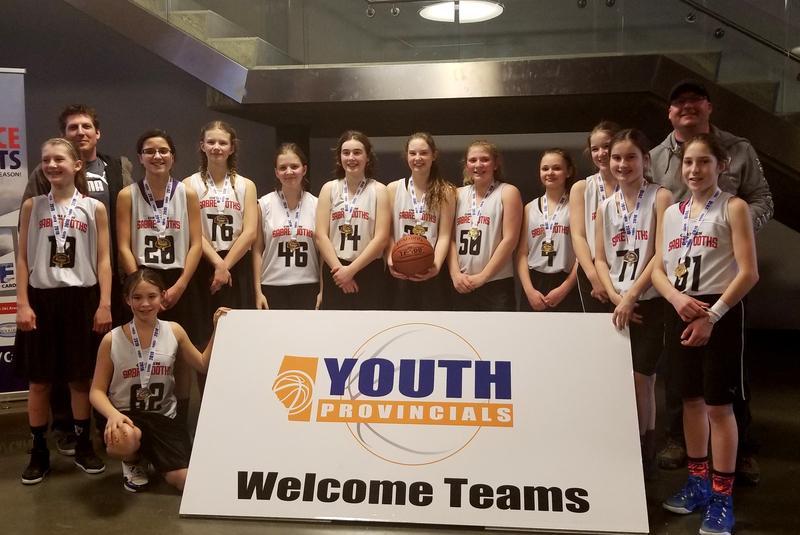 With these four wins at the Youth Provincials, the Bantam Girls finish an outstanding season with a record of eighteen wins, three losses, and one tied game. This includes EYBA play and a win in an exhibition game against our Bantam Boys team. Coach Darryl describes his team as, "the most coachable, eager to learn girls, who always played for one another. This was the key to our success."